Current GUI testing approaches validate the functional correctness of interactive applications, but they neglect an important non-functional quality: performance. With the growing complexity of interactive applications, and with their gradual migration to resource-constrained devices such as smartphones, their performance as perceived by the human user is growing in importance. 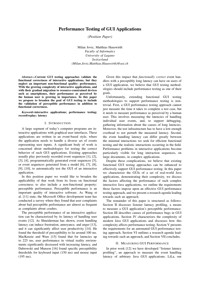 In this paper we propose to broaden the goal of GUI testing to include the validation of perceptible performance in addition to functional correctness.